Melt chocolate chips in a microwave on 30 second intervals, stirring throughout. Once chocolate is melted, reserve 1/2 cup for later use then spread remaining chocolate on parchment lined baking sheet. 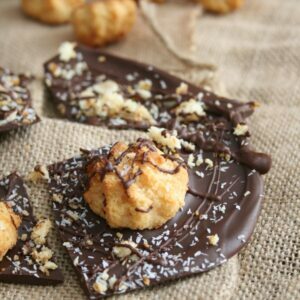 Press macaroons into chocolate then top with coconut powder and almonds. Using the reserved chocolate, splatter over chocolate bark. Allow to harden in fridge then break into pieces before serving. Store in fridge in airtight container or ziplock bag. Use your favorite flavored macaroons such as red velvet or carrot cake. Swap coconut powder and almonds for ground walnuts, sprinkles, chocolate chips, chocolate lentils or mini marshmallows.